This entry was posted on January 9, 2017 by Ryan Curtis. The Terminalia catappa is a large tropical tree in the leadwood tree family, it commonly grows mainly in the tropical regions of Asia, Africa, and Australia. This tree is what produces the Indian Almond leaf. 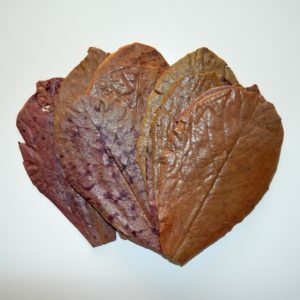 It goes by many different names, however in the aquarium hobby we have grown to call it the Indian Almond leaf. It has been used widely in the aquarium hobby for years as a therapeutic and medicinal purpose leaf. It is stated but not proven that these leaves aid in the process of creating a natural environment much much the following species live in; Bettas, Killies, Arowana, Tetra, Dicus, Dwarf Cichlids, Appistogramma, Rasbora, Catfish, and SHRIMP! The Indian Almond Leaf is said to help in the process of shrimp breeding by providing a beneficial spot for bacteria to grow that young shrimp can feed on. When the leaves are left in the tank a multitude of microorganisms will begin to colonize the leave and break it down. These microorganisms create a biofilm which is the preferred food source for shrimp, especially shrimplets. The Indian Almond leaf also release compounds that have anti-fungal and anti-bacterial properties. This helps the shrimp fight off many parasites. The leaf can be left in the tank until it is fully broken down, most often the stem is left behind and is the only thing that will need to be removed. Allowing the leaf to break down in the aquarium will have no harmful impacts on your tank. A common myth about the Indian Almond Leaf is that their benefits only come from their tannins. This view has been proven to be false. Humic acids this is including tannins do offer great benefits, Tannins offer many bacterial properties and are a component in many herbs. Almost any source of tannins will benefit an aquatic environment. Each leaf type offers its own benefits. The leaves from some tree species offer further therapeutic or medicinal properties based on their varying active components. The type, amount, and combination of these components varies widely from species to species. Analysis of Indian Almond Leaves thus far has revealed flavanoids, isovitexin, vitexin, isoorientin, rutin and triterpenoiods. Further identified are volatile oils, quercetin, corilagin, kamferolphenols, saponin, saponin glycosides, cardiac glycoside, balsam, and squalene. T. catappa leaf tannins include punicalagin, punicalin, geranin, granatin B, tergallagin, tercatain, terflavin A and B, chebulagic acid, and corilagin. - Antiparasite properties, including the eradication of Trichodina, Gyrodactylus sp. and Dactylogyrus sp. - Antibacterial properties have been proven against many strains, both negative and positive, and T. catappa leaf extracts continue to be explored as an alternative to antibiotics for the food fish industry. - Scientists have reported antifungal activity against Pythium ultimum, Rhizoctonia solani, Sclerotium rolfsii, and Aspergillus fumigatus. Indian Almond Leaf extract has also been used successfully as an antifungal for Tilapia eggs. - Immune system support has been verified in humans, to a point where it has helped HIV patients. In general it has been reported by many shrimp keepers to me that the Indian Almond leaf had aided in increased breeding, better vibrant colors, better male/female ratios, and better overall health of shrimp as they rarely die of anything other than old age. A word of caution, if you are new to using Indian Almond leaves start slowly with one leaf per 10 gallons, as to many leaves can prove to be toxic. A serious overdose would have to happen, however it is always better safe than losing your prized shrimp! When breeding shrimp I personally use Indian Almond leaves along with other types of leaf litter as I believe it from my experiences to aid greatly in the breeding process.